IRISH emigrants who moved to Canada were forced to adopt “French sounding names” so as to avoid detection by the British, Taoiseach Enda Kenny has said. Speaking at an early morning event in Montreal, Mr Kenny said the Irish story of emigration is “intrinsic” in the development of Canada. He said it is “extraordinary” that 15 per cent of Canadians have Irish roots. “Whether it’s Australia or New Zealand, Canada, Africa, US or Europe or South America or wherever - the Irish are there. For reasons of travel, of adventure, of forced economic immigration, of deprivation, of oppression, of hunger or whatever,” Mr Kenny said. “There’s a real story to tell. And Canada is an essential part of that story. Since they came here in 1600 first. Some changed their name to French sounding names, so they wouldn’t be recognised by the British as being Irish. In any event, they’re still here,” he added. Mr Kenny made the remarks at an event in the Concordia University in downtown Montreal. He later met senior bankers ahead of a scheduled meeting with Canadian Prime Minister Justin Trudeau on Thursday afternoon. It’s widely anticipated that the trip will be Mr Kenny’s last foreign engagement as Taoiseach. In his broadly unscripted speech this morning, Mr Kenny focused on the theme of emigration. He said he welcomes the fact that Canada adopts an “open” visa system which allows many Irish young people to study and live in Canada. 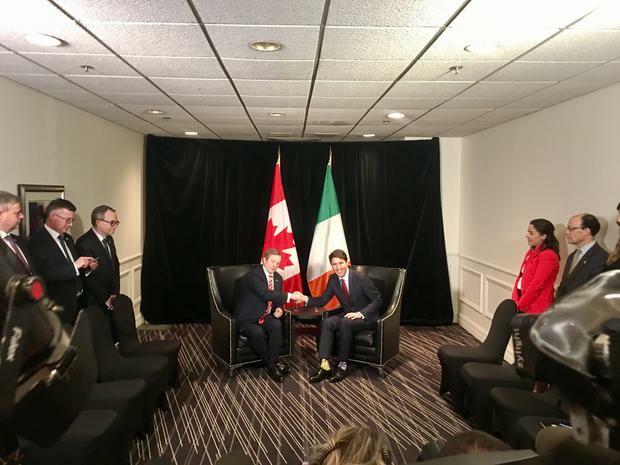 Mr Kenny said the St Patrick’s Day parade in Montreal was attended by Mr Trudeau. “The parade has turned just from being Irish to an expression of irishness. Of Irish pride in our heritage and tradition. These have become important all over the world now in the sense of iconic buildings becoming green,” Mr Kenny said. “They all want to do it now, from Christ to the redeemer, the fountain in the White House, Niagara falls to other places, the great wall of China and so on.